Apprentice chef Thomas Martin, 22, was named Foundation Apprentice of the Year at the prestigious Apprenticeship Awards Cymru held at the Celtic Manor Resort, Newport on November 9. He said “I’m absolutely elated. This award means the world to me. For me it’s the next step in my career and I want to be a champion chef in Wales, my adopted country. Thomas is following a career path that he hopes will lead him to achieving his ambition of opening his own restaurant in Cardiff to champion the very best Welsh ingredients. He has worked at Manor Parc Country Hotel and Restaurant, Cardiff, Chapel 1887, Cardiff as well at the Principality Stadium as a member of the catering team for the Champions League final last year. His work experience in London included spells at Restaurant Gordon Ramsay, Michel Roux Junior’s Le Gavroche, Marcus Wareing at the Berkley, Nathan Outlaw’s restaurant Outlaw’s at the Capital and World’s End Market, Chelsea. “It was a great experience and who wouldn’t take the opportunity to work in three Michelin starred restaurants at the age of 20 or 21,” he said. “The experience altered what I wanted out of my career and it made the path I needed to go down a lot clearer. 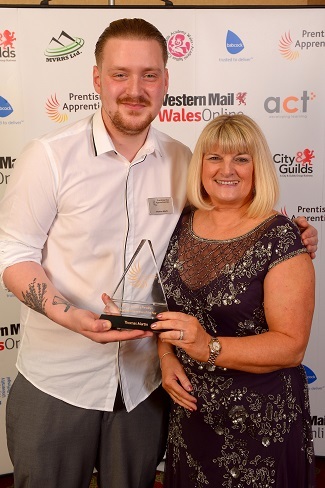 Minister for Welsh Language and Lifelong Learning, Eluned Morgan congratulated Thomas together with the other award winners and finalists for setting the gold standard for Apprenticeships and Traineeships.